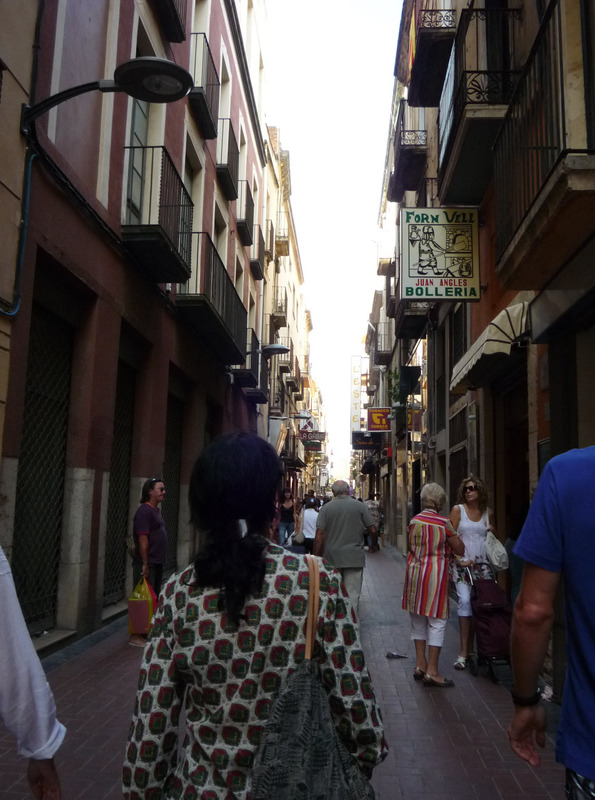 Once we finished up in the Gaudi Centre, we headed back out to the streets of Reus to do a little shopping, pick up our compras from the market from earlier that morning, and enjoy an early lunch. Finally posting for Day 5, folks – with apologies for the delay! I never dreamed there would be this much to DO just to get back to “normal” after being on vacation for a few weeks! Sheesh! We planned to have an early morning to give us time to head over to a nearby town for the day. Breakfast was quick: fruit, granola, yogurt, and some of those gorgeous tempranillo grapes from the winery visit the day before. Yum! A scratchy throat sent me in the direction of hot tea instead of coffee, which earned me a sound finger-wagging about sleeping with the A/C on. Alicia sternly lectured me about the importance of sleeping in the ambient (read: sweltering) temperature and of keeping my neck well-covered ferchrissakes, especially if my throat was feeling scratchy. You see, you may not realize this, but in Spain, air conditioning is generally viewed as something like the spawn of Satan. If you use it, you are practically begging to catch pneumonia. All that cold air, that rapid difference between the ambient “real” temperature and the “fake” A/C temperature only serves to weaken your body and forces your throat to get sick according to many Spaniards. What’s more, if you use the A/C and have a naked neck, you may as well write your epitaph. Enter your email address to be notified of new posts! This work by https://shawncita.wordpress.com is licensed under a Creative Commons Attribution 3.0 Unported License.